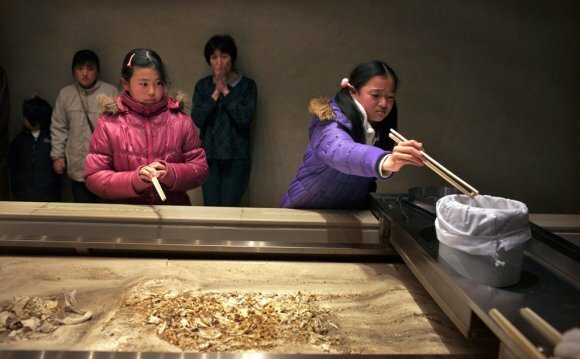 With more people being cremated rather than buried after death, ash-scattering ceremonies are gaining in popularity. But what happens when it doesn't go according to plan - or if no-one collects the remains? There is a moment in the film The Big Lebowski where the Dude (Jeff Bridges) and Walter (John Goodman) take their late friend Donny's ashes to a cliff top. Walter insists on saying "a few words", then scatters Donny's mortal remains from a coffee tin. But prevailing winds mean that Donny, instead of ending up in the "Pacific Ocean, which he loved so well", ends up all over the Dude. For a meaningful, solemn occasion to be unexpectedly blown off course is a real and increasing phenomenon. We want to say the right words, in the right place, at the right moment and with all the right people in attendance. But it doesn't always go according to plan. Adam Heath, a funeral director from Sheffield, has noticed a shift in how the bereaved treat ashes during his 30-year career. "It used to be that everyone was scattered at the garden of remembrance [at] the crematorium, " he says. Now, as fictional depictions of ash-scattering are more common, they prefer to take the ashes to a location with personal significance for the deceased. "They would like to be able to do their own thing, too." Although some 70% of Britons will be cremated, few specify what they would like done with their remains. Those left behind have to make an educated guess. "One minute he's your dad, then the next you've got this urn - plastic and disappointing, " says Sally, of Bristol. "You want to do it poetically, like in the movies, but there's always more of it. And, in the end, you're like 'Oh, just tip him out.'" Kevin Browne, bereavement services manager for Broxtowe Borough Council, says it is part of our national psyche to be surprised by ashes. "We're so British, we don't talk about death, do we? People aren't aware of the options they'll have - they haven't given it any thought at all. "On TV you just see a token gesture [amount] being scattered - a couple of eggcupfuls. The quantity and weight seem to catch people off guard." And that's if the ashes are even collected. Funeral directors up and down the country have a room of unclaimed ashes. These can range from tens to hundreds of ashes, some of which date from the late 19th Century. Uncertainty about what to do with these remains is certainly a factor. Ashes do not belong to anyone, in the same way as a person cannot belong to another under British law. Ashes will be returned to whoever made the funeral arrangements, not necessarily the next of kin. Nor do funeral directors press the issue with the recently bereaved, says Heath. "It's important, to arrange someone's funeral, to get some insight into their psyche, to get what's right for them at the time. But what they want to do with the ashes, collecting them or not, I don't want to take sides or pick a fight." Until recently, there was scant advice for funeral directors on what to do with unclaimed ashes. In December, the National Association of Funeral Directors published guidelines stating that unclaimed ashes must be stored for at least five years, with efforts being made to locate the rightful recipient, before a funeral company could dispose of them. This includes scattering them in a garden of remembrance or at a beauty spot - with the landowner's permission - or interring them. Douglas Davies, of the Centre for Death and Life Studies at Durham University, says even Britons who are not religious want to mark a loved one's passing in a way that reflects that person's values and preferences. "In the Christian idea, people thought you would gain a new identity in heaven. But with a decrease in this idea, this 'looking back' [at a person's past] came on - and there were the cremated remains as a symbol." But death and human remains can have shock value, as the comedian Sacha Baron Cohen showed at last month's Oscars ceremony. Carrying an urn emblazoned with the image of the late North Korean leader Kim Jong-il, he began scattering the ashes on the red carpet, claiming this to be the dying wish of the leader - who, incidentally, had portrayed himself as a film buff. Security did not take kindly to the gesture. But fulfilling one's identity through their ashes is what many hope to do. Famously, journalist Hunter S Thompson's ashes were fired into the sky - as per his wishes - in a giant firework, paid for by his friend Johnny Depp. Others want their ashes turned into vases or records - voice track optional - or perhaps scattered from a specially designed plane. So the choice is yours. Or at least, it should be.